Mary and I had to dodge tornadoes on our way back from Mississippi. Mother nature gave us more reasons to love the US 79 route over Interstate 20 and 35. My second night at Rainwater Observatory lacked the spectacularly dark skies and dew of the first night. The poor transparency ahead of the storms left the skies looking more like Austin's urban light dome skies. I did get more shots of the Moon and some night shots of the observatory complex. Jon Talbot spoke on his outstanding deep sky astrophotography work; much of it from a urban site under a light dome lit by an oil refinery and Gulf coast casinos. Paying careful attention to gradients can give you dark sky results from an urban location. Dan Llewellyn spoke about the revolutionary deep sky results possible with the latest Sony one shot color mirrorless cameras. He's able capture DSO images with a few minutes of exposure with a cooled Sony alpha A7s with amazing details. He showed A/B comparisons with detail that wasn't visible with hours of exposure with a conventional astro CCD camera. I didn't know that M57 has an eyebrow! Dan has an earlier article on using OSC cameras for planetary astrophotography in the May 2014 Sky & Telescope (editors' summary). The Mid-South Star Gaze was also the host for a Questar Meet organized by Fred Rains! Fred gave a talk on the Questar telescope Saturday. 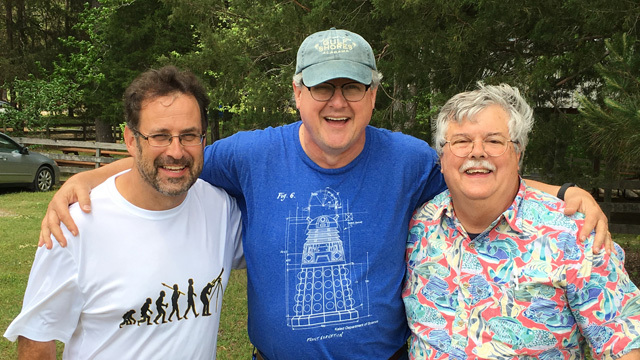 He's the man in the middle of a rare, caught in the daylight, image of three Questar users. I had a great time at the Mid-South Star Gaze. 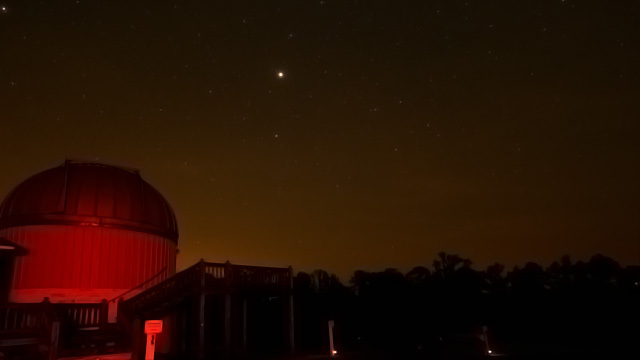 French Camp and the Rainwater observatory and planetarium complex is a terrific site for a star party. The skies are very dark and steady, the people friendly, and the talks interesting.